DALLAS – Surgeons can now receive educational certification in oncoplastic surgery – the most advanced form of breast cancer surgery – through the School of Oncoplastic Surgery. The school brings together experts from around the world and across the nation to learn the various aspects of oncoplastic surgery. The two-and-a-half day course – which provides a minimum of 20 hours of certified medical education (CME) credits – instructs surgeons on how to optimize cosmetic results without compromising cancer control. SOS faculty member Anne Peled, MD, teaches SOS attendees how to perform oncoplastic and breast reconstruction procedures. The next SOS training will be held Sept. 8-10, 2017 in Dallas and will feature the well known and unique sculpture lab designed to help surgeons appreciate aesthetic aspects of breast surgery. Surgeon attendees often take the course more than once. Because demand is high, the school now offers courses twice a year. 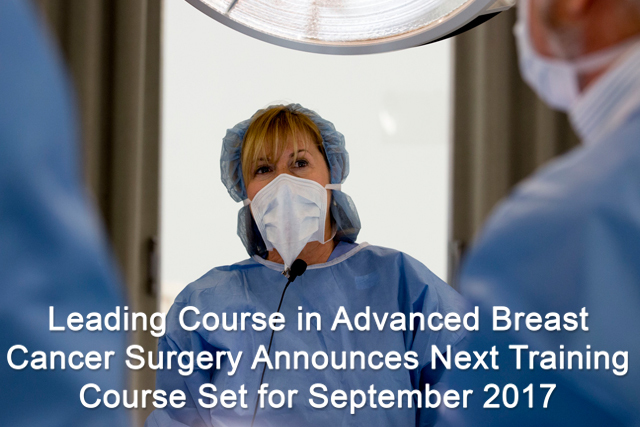 “The hands-on part of this training – with an expert faculty who really know what they are doing – makes this the best course I’ve ever done in anything,” said Dr. Daniel Howard, a breast surgeon at Lourdes Hospital, in Paducah, Ky. “The first time you go to SOS, you can learn to do the simpler things. By coming back for other courses, you can build on what you’ve learned and add on the next levels. There’s always something of value that you can take back home and implement in your practice.” The School of Oncoplastic Surgery offers a core curriculum of essential topics and rotates in well known and new faculty members for each training. It emphasizes a hands-on anatomy lab,small group learning, intensive sessions over the course of more than two days, and live model sessions. 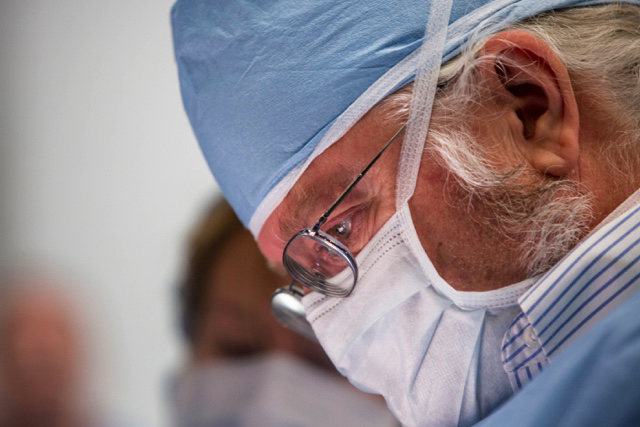 Each course limits the number of attendees so surgeons get an in-depth experience. The sculpture lab gives surgeon participants a unique perspective on breast aesthetics, size, shape and symmetry. The SOS certification criteria are based upon recommended guidelines set forth by several international organizations including the International Steering Committee on Oncoplastic Surgery. Full-day anatomy lab. 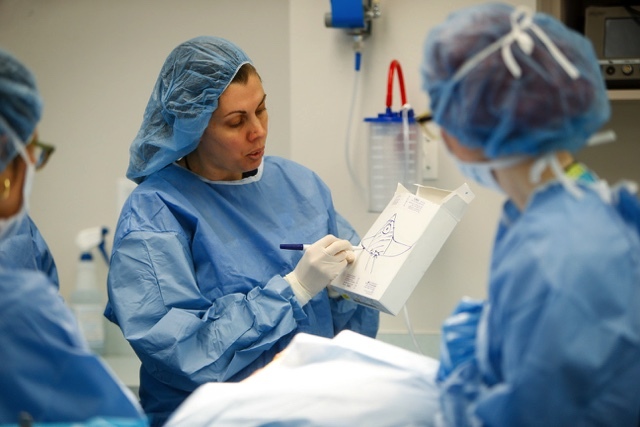 Attendees receive hands-on instruction and gain experience in multiple oncoplastic techniques. Lectures by experts covering topics in breast surgery & cancer care. Sculpture lab that uses clay casts from real-life subjects to teach attendees about aesthetics, size, shape and symmetry. Live models to learn surgical markings. Attendees learn the skin markings crucial to perfecting the art of OPS. Networking opportunities with faculty and colleagues. Surgeons work side-by-side with the faculty and network/socialize with each other throughout the course. Panel discussions. Current controversial topics of significant importance to breast cancer surgeons are discussed in-depth with leaders in the field. New Technologies. Surgeons gain exposure to new tools and learn how to integrate these into their current practice. Instruction on reimbursement coding when performing oncoplastic procedures. Oncoplastic surgery (OPS) combines breast cancer surgery with plastic and reconstructive techniques to achieve the best possible cosmetic results. Whenever possible, OPS can help increase the number of women who can have breast-conserving surgery (lumpectomy). In this way, the cancer removal can be performed in conjunction with a breast reduction, augmentation, lift, mastectomy or reconstruction, taking into account patient preference and clinical circumstances. The School of Oncoplastic Surgery was founded in 2007 by Dr. Lebovic with a grant from the Mary Kay Ash Foundation. Dr. Lebovic is a past president of the American Society of Breast Disease, recipient of several distinguished awards, and the inventor of multiple successful medical technologies in women’s healthcare.